Smiley is one statuesque cookie! Smiley is celebrating his 25th anniversary this year, and he’s doing it in style. He recently visited our Waterfront restaurant to unveil a surprise – A statue of himself, right in the lobby! Though lacking Smiley’s charisma and huggable charm, his look-a-like definitely sports Smiley’s dashing good looks – you can barely tell them apart! 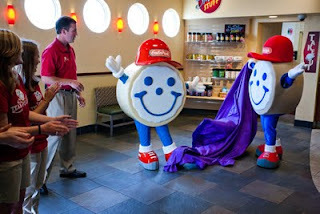 Smiley unveils his life-size look-a-like at our Waterfront restaurant. The statue was created by Ron Seman of The Object Works, right here in Pittsburgh. Ron’s company has also designed some really cool models for movies, TV shows, and ads – click here to see some of their work. We’ve worked with Ron before – in fact, he designed several pairs of giant sunglasses for Smiley to wear during his first beach party. It was only natural that Ron be the one to create Smiley's double! Smiley’s statue isn’t the only surprise in store for the summer. 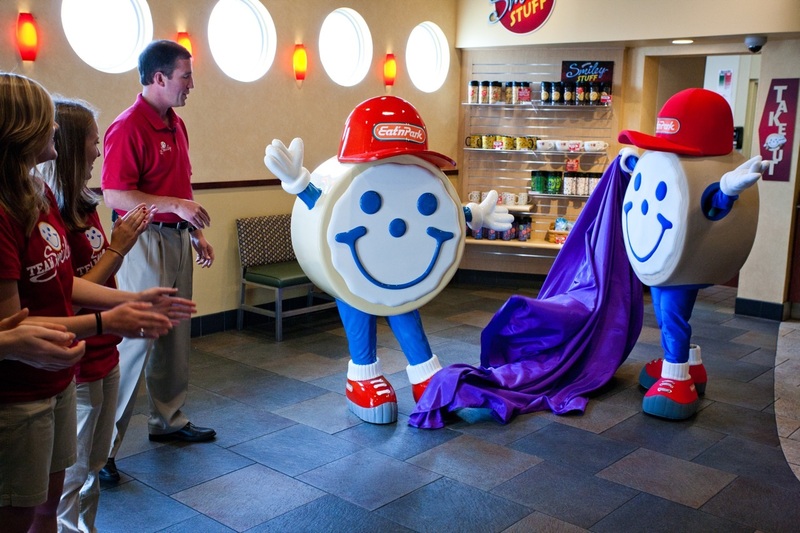 Stay tuned to see what else is happening to commemorate Smiley’s quarter-century milestone! Can you tell which Smiley is the real one? Great Gifts for Dads and Grads at Eat'n Park! 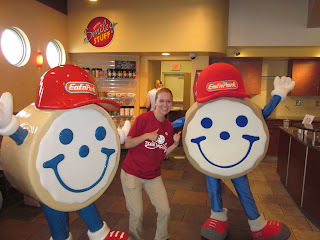 Summer Specials are here at Eat'n Park!